When we first started figuring out what was going on with Beckett, I posted a picture to Instagram about what we had experienced. 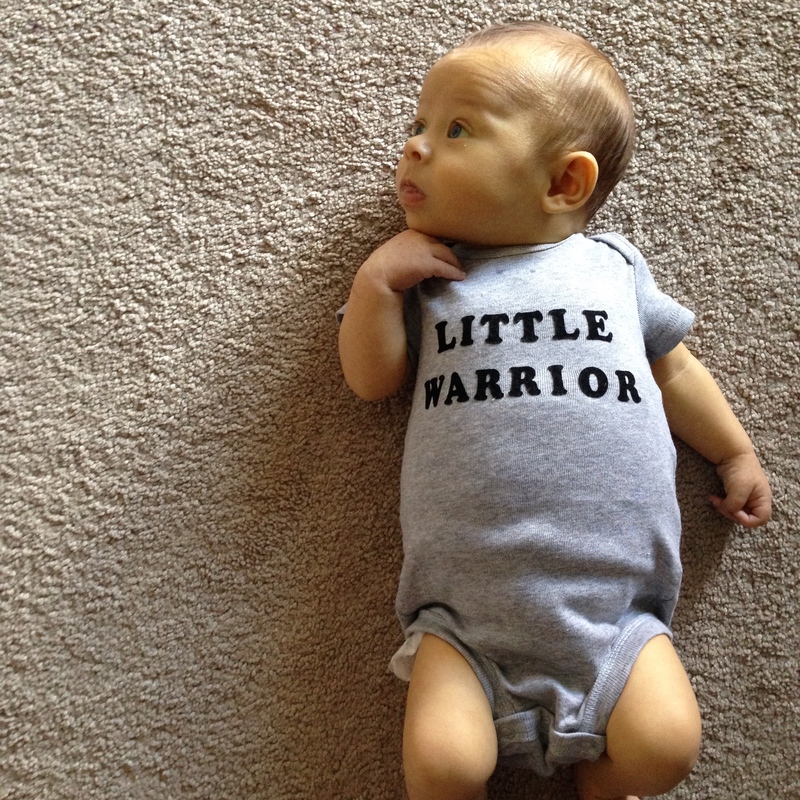 I mentioned that Beckett was going about everything with such a happy demeanor and I called him my little warrior. I don’t know why that word popped in my head specifically instead of a more common word like fighter. But it came so clearly. He was a warrior. I’ve pondered a lot lately trying to figure out why that word was so important. As I was thinking about it last Wednesday, a story in The Book of Mormon: Another Testament of Jesus Christ about the 2,000 stripling warriors came to mind. I decided to make that the object of my scripture study the next day. It just so happened that Thursday, Shawn took Addie to preschool and Beckett took a long nap. We had a very quiet morning and I was able to spend some good time with my scriptures reading the story of the 2,000 stripling warriors and thinking about it. This story is about a group of people who after repenting of their wickedness, made a covenant with God that they would never take up arms again. Well war came upon them. Their brethren were fighting for them and they felt bad because they weren’t helping. They were about to take up arms and fight when their sons (who had NOT made the covenant) said that they would go to war for their fathers. As they fought, they were injured but NOT ONE of the 2,000 sons was killed in battle. What I learned from reading this story was amazing. It has changed the way I view our situation. I started in Alma Chapter 53 and got to verses 20-21. Here Helaman (their commander) is describing these young men. I felt so strongly in my core that this is Beckett. I believe that my little man is so courageous and is doing much better with this situation than either Shawn or I. It doesn’t matter that he is a two month old baby. I remember when he first smiled at us after his surgery. There was a look in his eyes. He had this. He was ok. It was like he was telling us that he was fine. His courage strengthens mine. And then I read that last line again, “Behold our God is with us, and he will not suffer that we should fall; then let us go forth.” How true this is. Our God is behind us. He will watch over us and protect us. Those 2,000 warriors knew that and they went forward in faith. Beckett is the same. He is so happy and trusting, even with the scary things that have happened to him. I then moved on to Alma 56:47-48. 47 Now they never had fought, yet they did not fear death… yea, they had been taught by their mothers, that if they did not doubt, God would deliver them. Now I have read this story many times in my life. I have always thought of how amazing those mothers were. But reading it this time with Beckett in mind, it struck me so differently. I am now the mom of a warrior. This is me. This is my responsibility. And in order for me to teach my son, I need to believe this. And live it. Faith. It all comes down to faith. Their mothers instilled such faith in them that they were willing to go into battle. I want my son to be strong. I want him to be able to handle things with courage and with happiness no matter how bad things get. And in order for that to happen, I need to be the example. By this point I was in tears. I felt such a greater love for those mothers. I knew that I wanted to be just like them. And then moved to Alma Chapter 57:21, 26-27. I started to think of Beckett’s future. Oh how I wish this for him. He has already proved to be so strong but I pray that he can fight with the strength of God as he undergoes many challenges in his life. I know that he can have a wonderful life despite the health issues. I love that last verse because I can see my son in it. He is young. His mind is firm. And I can see him putting his trust in God for the rest of his life. I know God is there for him. Christ knows exactly what Beckett has been through and what he will endure. He knows it perfectly and is the perfect person to rely on through all this. That’s not to say that we aren’t going to have hard days. We will. Probably a lot of them. We are going to struggle at times. But if we will trust, if we have faith in our Savior, we will conquer whatever comes our way. I love my son. I love him so deeply that I will be strong for him. I will teach him what I know. I will teach him faith. We will make it through this together.